There’s nothing like sitting around a roaring campfire, eating ‘smores’ and singing camp songs. Summer comes alive February 17th from 4-6 pm at the Garnet Williams Community Centre in Thornhill as Jewish Summer camps join PJ Library in the launching of its newest initiative, ‘PJ Kids go to Camp.’ The fun fair will include an afternoon of free activities and entertainment for young families featuring camp style games, crafts, songs, story-telling and of course camp snacks! The sing along around a ‘faux’ campfire will be sure to provide visitors with an authentic camp experience in the middle of a cold Toronto winter. The event, in partnership with the Ontario Council of Jewish Camps and UJA Federation of Greater Toronto, will also give families the opportunity to learn more about the myriad of Jewish not-for-profit camps in Ontario. Participating camps include Camp George, Camp Gesher, J. Academy, Camp Kadima, Camp Northland BB, Camp Ramah in Canada, Camp Shalom, Camp Solelim, Camp Moshava and The Jack & Pat Kay Centre Camp, the one day camp represented. Camp staff will be leading the fun at all activities. The impact of Jewish summer camp cannot be ignored. According to a recent survey by the Foundation for Jewish Camps , the influence of summer camp on the ways in which adult Jews choose to engage with the community can be felt long after the last sunset of the summer. Camp attendance increases the likelihood of adult participation and identification in the Jewish community, and in the practice of Jewish behaviors in their lives, from Shabbat candle lighting to using Jewish websites, as well as the appreciation of the value of Jewish charity. 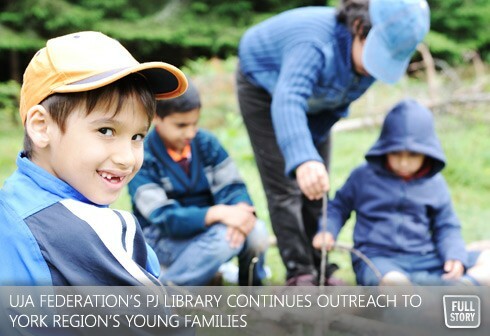 PJ Library, a program of UJA Federation of Greater Toronto, has been at the forefront of outreach to young Jewish families in York Region since its launch in the region in May 2010. The program is part an international award-winning program that offers free, high-quality Jewish books and music each month to children between the ages of 6 months and 5 ½ years old and provides monthly family programming. Over 1800 families are currently part of the local PJ community. PJ Kids programs will focus on the 6-9 year olds who have ‘graduated’ out of the PJ Library programming. PJ Library Kids Go To Camp is a free event, however registration is required at www.pjlibrary905.ca. For more information about PJ Kids Go to Camp, Sunday February 17th from 4-6 pm please contact pjlibrary@ujafed.org.